Hyggested is a cozy cabin on Devil Track Lake. The perfect lakeside getaway for those who love the outdoors. Hyggested is a cozy lakeside cabin on a large lot that leads right into the waters of Devil Track Lake. Here you are close to many Devil Track Lake activities. In the summer you can enjoy fishing, swimming, and boating. In the winter months you can enjoy ice fishing and are in close proximity to snowmobile trails. This quirky little cabin has two bedrooms and one bathroom. There is a lake-facing living room with a small electric fireplace, great for curling up in front of with a good book on a cold winter's night. There is seating for five at the dining room table, or you can enjoy a meal outside on the lake-facing deck or head down to the shoreline and grab a seat next to the fire pit. Cast your net off the dock, take a dip in the cool water, or enjoy the sun on the swimming raft. You can launch your canoe or kayak right from the property. Motorboats can be launched from the public boat landing just a couple of miles away. There is never a dull moment on Devil Track Lake, no matter the season! 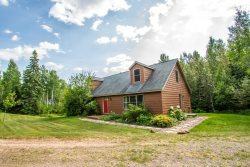 Get away from it all while still being in a nice location conducive to exploring the beautiful North Shore area of Lake Superior. You are just a couple of miles from the Gunflint Hills Golf Course for a relaxing round of golf. Pincushion Mountain is also a short drive away and has miles of hiking trails. Drive into Grand Marais to enjoy a day of shopping and dining at the many unique, locally-owned shops and restaurants along the Grand Marais Harbor. Take the short stroll out to Artist's Point and the Grand Marais Lighthouse to really experience Lake Superior. In the evenings, head around to the north shore of Devil Track Lake by car or canoe to Skyport Lodge and Raven Rock Grill, Devil Track Lake's popular restaurant and bar, serving a full menu and offering a lively ambiance for the Devil Track Lake community. After a long day of exploring the North Shore head home and light a fire in the outdoor fire pit. Gather around and make s'mores and share stories of your adventures. Hyggested is the ideal base camp location for a Devil Track Lake and North Shore outdoor adventure. Allergy Warning: The owner's of Hyggested have cats. Guests renting this property should be aware that the cats frequently visit the cabin and a dander-free home cannot be guaranteed. This is also a pet-friendly property and various types of pets may visit. Note About Layout: Hyggested has a unique layout. You must pass through Bedroom 1 and the bathroom in order to get to Bedroom 2. This limits the amount of privacy in the bedrooms and bathrooms. This layout is ideal for families. Excellent. Good service. Good follow up. The focal point of the cabin for our family of four in the depths of a winter vacation was the large dining room table with a view of the lake. We spent many lovely meals gathered around the table, and dark winter evenings playing a variety of card and board games. As described in the promotions, quirky is an apt description for the layout of the two bedrooms joined by the bath and hallway. It was great to be only a short drive from Grand Marais--town was easily accessible, but we felt nearly alone in the woods. Everything was great. From the initial booking on the phone to the info in the emails. Everything was great. It was what we expected. Shower could be updated. The CVR team is always friendly, helpful and professional and a pleasure to deal with. 1) Appliances worked well. 2) Wi-Fi worked well. 20 MB Download and 10 Upload, plenty fast! 3) Nice non-stick cookware to use. 4) Dock and fire-pit were great. 5) All the blooming flowers were nice. 6) Good amount of fresh towels and washcloths & soap, etc. 7) Caught walleyes straight off the dock about 100 yards. 8) The neighbor to the west named Ken came over and was helpful. 9) The front driveway turn-around was nice especially when pulling a boat.